I've been in debates whether to write this review as I suppose it's a little down to personal opinion but having just gotten out of the bath and used it again, I still definitely feel the same about it. 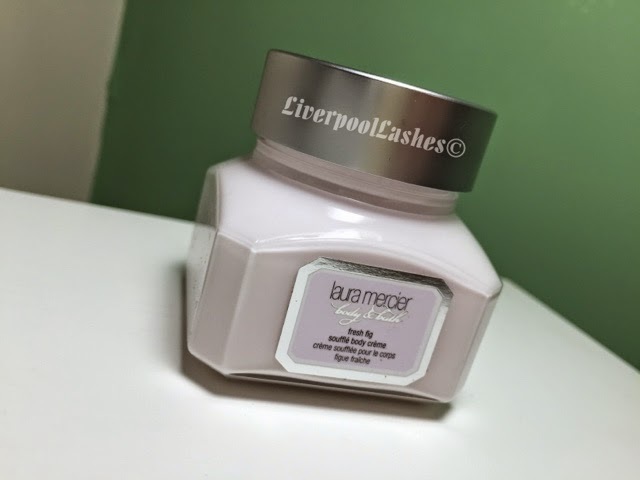 Today's post is about the Laura Mercier Body & Bath Souffle Body Creme in Fresh Fig. I've already spoken about another one of these soufflés which I loved but this one just isn't cutting the mustard. Just like the others from the line, it has beautiful, luxurious packaging. The cream itself has a lilac tint to it and it's fairly thick and gorgeous to apply. The problem I have with it is the scent. It's hard to describe the initial scent but it's not too bad when you smell it straight from the pot. The issue I have is within fifteen minutes of it on my skin the scent hanged from something okay to something that's almost mossy or mouldy. I just don't like it at all. I know this is all down to personal preference but if you can try this as a sample before you buy it I highly recommend you do it. I would definitely not purchase another in the Fresh Fig scent.